Grow offers opportunities for people of all ages and ability to get involved with growing food and connecting with their community. Started in 2008, GROW is a small charity working with communities to create community gardens in their area. It’s as much about growing community as it is about growing food and flowers. As we develop, we try out new things and if it works it becomes part of our model. So cooking and eating together is now a big part of what we do in our weekly sessions! We try to bring those who may be isolated, suffering with mental or physical health issues, or those who just want to spend a bit more time outdoors together, all while enriching the local area. Currently, we have two gardens – one at The Waterworks in North Belfast, and one at Camberwell Court where we work with older people (60+). In addition to our weekly sessions, we hold community events which are open to all the community. Volunteers Do you have some time on your hands and would like to get involved in your local community have a bit of craic while you’re at it? Can’t give a weekly commitment? – don’t worry you can still volunteer. 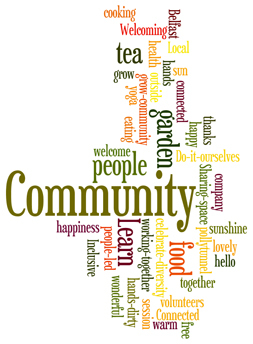 Weekly Community Garden Volunteer – no special skills needed, just 3 hrs per week and good with people. Experience of growing or cooking would also be useful. This person will help the Grow Community Gardener at our weekly sessions. 16 hrs per year – Specialist skills – less time. If you are a builder, plumber, carpenter, DIY person, administrator, good cook or feel you have some skills we could use and could give at least 16 hrs per year Grow would be very grateful for you involvement. To find out more on becoming a Grow Volunteer email to craig.sands@grow-ni.org. Participants There are a few places left for the Tuesday Morning Session at the Waterworks. If you know someone who could benefit from being involved get them to come and visit us while we are there or contact Craig Sands – craig.sands@grow-ni.org. We have a waiting list for our other sessions, so if you would like your name put on the list let us know.